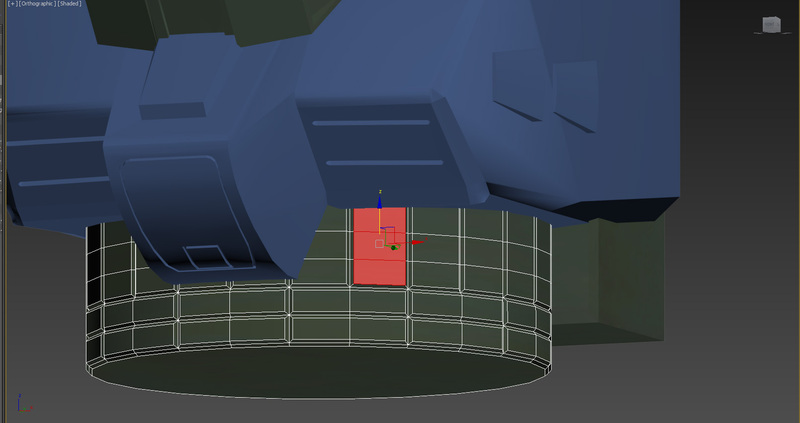 With the first goal of getting the H128 Bigfoot modeled (( http://forums.cgsociety.org/showthread.php?f=43&t=1463716 )) at it’s end I’m beginning my second phase of the project. While the general appearance of the Battlemaster isn’t a far cry from the parent anime design there are several areas that will need remodeling. Also just as I found small little detail differences between my 1:72 scale model and the online Bigfoot pictures I assume to be a larger 1:48 run, there are differences between artist depictions I’ll have to sort out. Note the complexity of the armor panel lines in the last two images and the game miniature compared to the clean lines of the first two images. There’s also the cockpit to consider. Unlike the Bigfoot which only has the tandem configuration the Battlemaster is predominantly a single seat though the dual cockpit is canon with the additional advanced rules for the game. I plan on making both options available with simple switch out. Even though I do own a copy of the ‘blueprint’ poster it’s still roughly the same lack of information of information on hidden controls. 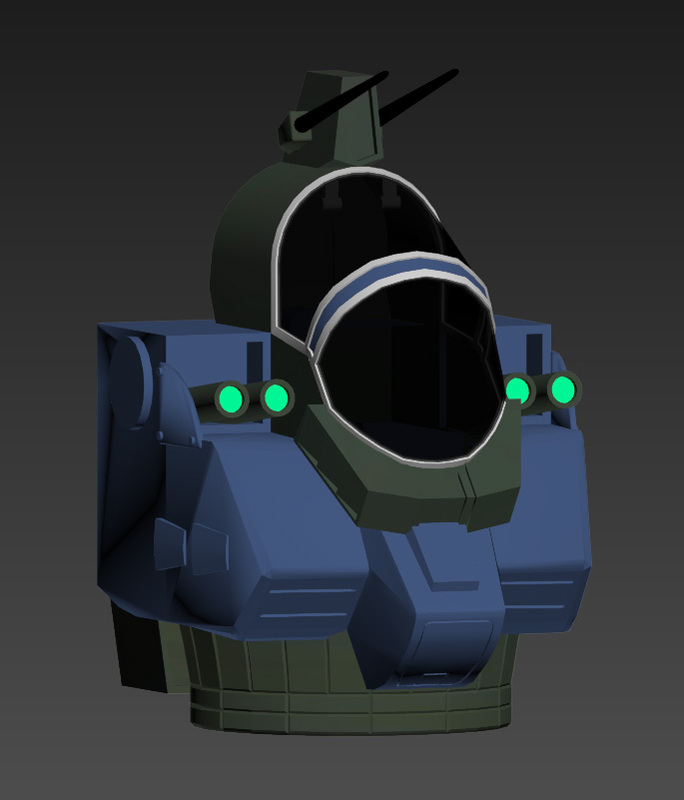 There will also be extra work on the pilot(s) as the gear and uniforms in the Dougram anime were fairly easy and straightforward to duplicate with some basic clothing retextured and a sphere reshaped into the helmet. The neurohelmet of the Inner Sphere is a rather unique piece of headgear that seems to have several variations with era and even faction. Picking references should be interesting. The second part that I both look forward to and dread are the cooling vests to deal with the heat generated by combat conditions given the in-universe motive and weapon systems. The curling tubing usually depicted should be interesting to figure out. With the groundwork laid out I’ll start with the head and work down the figure. Starting with the ‘crest’ of the head with the antenna. As the references show the Battlemaster does not have the dip in the middle of the crest. It is also taller without the ‘screwhead’ and recessed geometry at the back. The only departure is the blueprint that has it short. The antenna also are middle to far back which I’ll follow and ignore the placement off the top back edge the miniature has. So far just a simple manipulation of existing geometry. The bent red tube only seems to be present in the blueprint as some form of ‘intercooler’ and absent from the other depictions. So it will go as well. 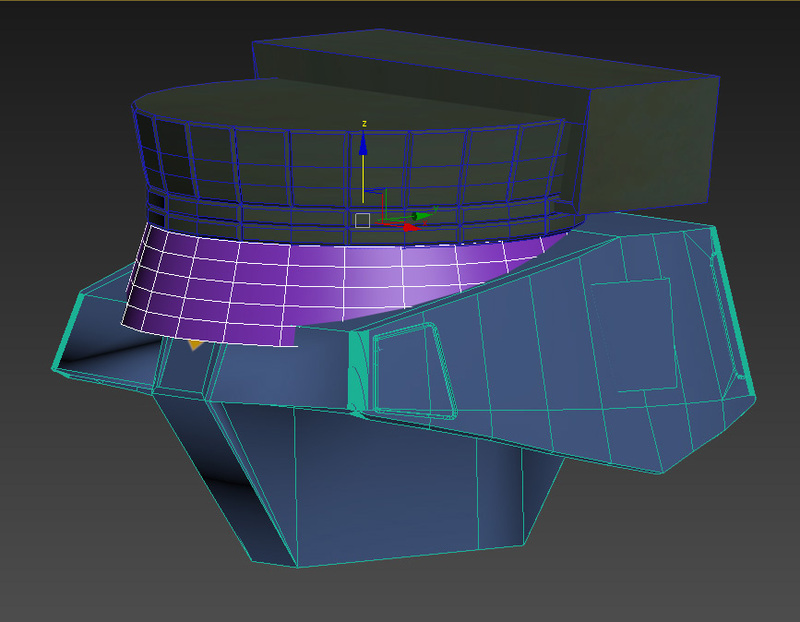 The sides of the head also do not have the hatch-like panel which will require some target welding of vertices after deleting the hatch and it’s details. I’ve got rid of the vertice that made up the dip by target welding them to the back. Getting rid of the back recess was also a matter of welding verts. The ‘screw head’ was a separate element so was easy enough to select and delete. Same with the bases for the tube. Despite the two references that have the oval launcher every other iteration has a square launcher so that is canon as far as I’m concerned. The missiles will have to be shortened from the full launcher length the Bigfoot carries. What I’ve watched of the Dougram anime it appears that every launcher carries just one salvo of missiles exactly as long as the launcher and the model kits back that up. Battletech however has internal ammo bins that carry multiple reloads which given the quantities listed mean much shorter missiles. Looking at the miniature it seems the vent remains on the back of the head possibly as one of the eighteen heat sinks the design carries though the only ones shown on the record sheet are four leg mounted. Side panel on the head removed from both sides and the front of the launcher framed a little so it’s just not a flat plane. The missiles have been recolored. As I mentioned before the missiles have been shortened. This is just a little bit of my own crazy, but as the record sheet lists the left torso as carrying 30 salvos (180 individual missiles) I just had to make sure mine would magically fit in that space. It’s a bit tight and the machinery to move it around would have to be very compact but that’s 180 in the torso. Been a bit since I could work on this project with having to pack up and move. 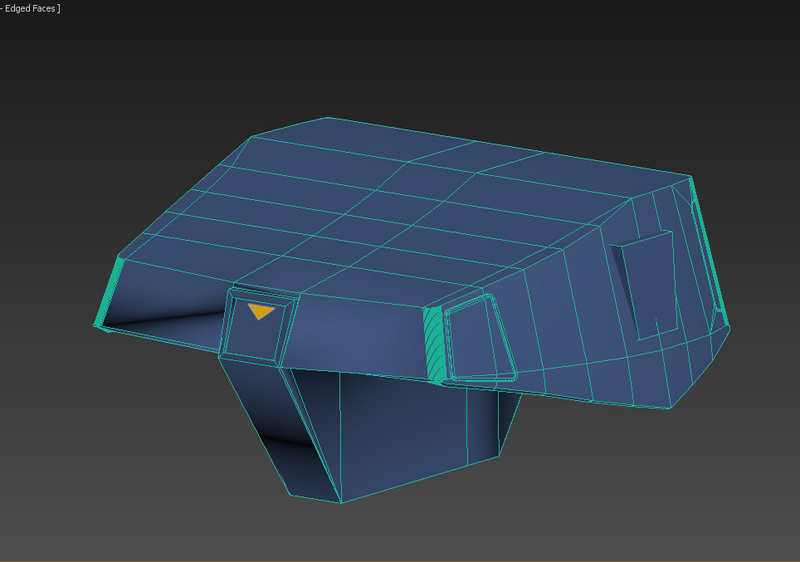 Current progress is I’ve got the majority of the back cleared of modeled in recesses. I’ve upped the number of louvers on the vents to three based on the detailing on the back of the mini. The lower torso is very roughly represented with a cone that I’m stating to shape at the back. After some more study I’ve discarded the cone for a cylinder and the back portion is just a box with a shallow recess in the front. A quick count on the miniature shows 14 vertical panels with two horizontal bars below each two vertical panels vertical. I think the cylinder defaulted to 24 sides which is perfect. To construct each raised element I simply used bevel to extrude and move in the polygons enough to get the grooves between. It’s hard to judge if the upper waist is completely vertical or with a bit of taper so I fudged a bit of taper in. I also slid the ends of what was the smoke launchers forward and tinted the bottoms an emerald green. There is some conflict between novels and even PC games as to which color is what power of laser. As I mostly remember mediums being green consistently between the original Mechwarrior PC run that’s my choice here.